Use a professional block brush to clean and wash your workstation and table the proper way. Wash out your butcher bench table and meat processing tables with efficiency and productiveness by using the proper tools and materials! Scrub your stations to ensure sanitation and cleanliness for each use. Use a block brush to make old butcher blocks new again! Using the proper cleaning tools for cutting boards and wood surfaces means using minimal effort and time to rid your tools of any dirt and meat. A must-have accessory to any butchery, deli, commercial kitchen and restaurant! Not dealing with meat specifically? 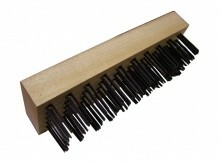 Use the hard bristles to remove dirt, rust, paint and more! A large selection of cleaning supplies here!